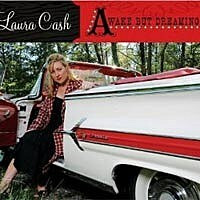 Laura Cash may have the all-star family name of her husband John Carter Cash, but she earned her musical success all by herself. One listen to the startling expressive fiddle on the title track of 'Awake But Dreaming' and Laura's crispy, rootsy vocals (think Patsy Cline meets Bonnie Raitt) throughout the new album, and you'll hear that for yourself. Recorded at the Cash Cabin Studio in Hendersonville, Tenn., the 12 tracks on the album are a mix of traditional country, swing, and bluegrass tunes from some of Laura's favorite musicians including Bob Wills, George Jones, Johnny Paycheck, Marty Robbins, Loretta Lynn, Hank Williams, Johnny Cash, and Dolly Parton. The Corvallis, Ore. native, began to hone her fiddle skills when she was in grade school. Her musical abilities really took shape at age 9 when she received a restored fiddle, thanks to her dad working a deal with a local violin maker in exchange for building a two-story deck on the man's house. That was just the start of her family's support of her musical dreams. "My family endured traveling every summer to many fiddle contests all over the country together," Laura says. Hear samples of Laura's new album, which is now available, here.